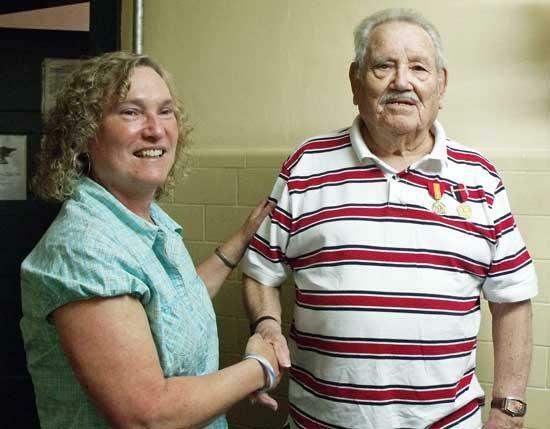 Penny Daniels, Cannon County's Veteran Service Officer, congratulates Charles Baird after he received his medals. On Monday, March 21, Charles Baird was presented his Army Medals. Mr. Baird, who served during the Korean War from 1951 to 1952, was awarded the Army of Occupation Medal with the Germany Clasp and The National Defense Service Medal. Mrs. Penny Daniels, Cannon County's Veteran Service Officer, assisted in obtaining the Awards and presented them to Mr. Baird. Mr. Baird's three daughters, Sara Patton, Renee' Hutchison and Lisa Baird, granddaughter, Amanda Patton and great grandson Wesley Patton, were also present at the presentation. The family is very proud of Mr. Baird and his service to our country. All veterans should be recognized for their sacrifice and commitment to ensure our freedom. For Veterans who have not received their service time medals and would like them, they can contact the Veterans Service Office at 615-563-6683 to set up an appointment. The Veteran needs to bring their Discharge Papers with them (DD Form 214). In the event the Veteran has passed on, next of kin can request their loved ones medals. Or if you are a Veteran in need of any other Veteran Benefits please contact Mrs. Daniels at 301 West Main Street, Suite 229 Woodbury TN 37190. I sure hope this was meant as the KOREAN war! I've never heard of this other war... LOL The very best to the vet and his recognition! Congratulations Mr. Baird. Those of you who do not know him should take the time and introduce yourselves to him next time you see him in person. He is truly a great man. I am very honored to know him.